Extra, Extra Large Ornate Silver Wall/Leaner Mirror 100cm x 200cm An ornate oversized floor leaner or wall mounted mirror in an extra large size. 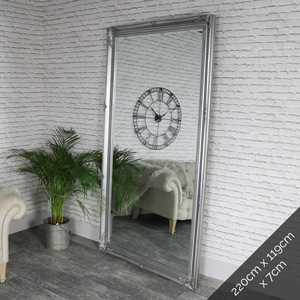 perfect as a shop, dress shop or dressing room mirror This Extra large wall mirror has an overall size of 100cm x 200cm with the mirror part measuring 58cm x 158cm, can be wall hung horizontally or vertically with the 3 metal hooks attached to the back of the mirror. The mirror weighs 25KG and is very sturdy. This Extra large wall mirror has an overall size of 100cm x 200cm with the mirror part measuring 58cm x 158cm, can be wall hung horizontally or vertically with the 3 metal hooks attached to the back of the mirror. The mirror weighs 25KG and is very sturdy. The frame is made from wood with a resin overlay. 3-12 working day service. We can offer quicker delivery via a pallet courier with an extra charge, this can be selected at the checkout.